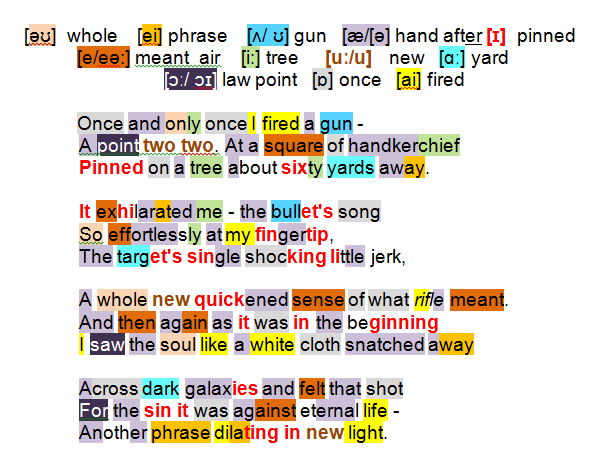 The poem expresses a move away from the Catholic lessons to which Heaney was exposed as a boy (he might have said ‘overexposed’); his sole experience of firing an air-rifle (Once and only once) brought about a re-appraisal of soul, death and eternity. The piece contains reference to Catholic liturgy with which Heaney is no longer comfortable. Furthermore but unstated here, adult Heaney would be exposed to a long and sickening cycle of murder and revenge in Ulster in which the rifle figured prominently as a weapon of destruction. For all the air-rifle’s small calibre (point two two), its tiny target (a square of handkerchief) and the distance involved (sixty yards away) taking an entirely successful potshot thrilled the youngster – he heard a new music (the bullet’s song) and felt a new empowerment within his easy control (effortlessly at my fingertip). Then within the split second of the pellet’s impact, elation turned to consternation (shocking), the target responded as if mortally hit (single … little jerk) shedding new light in the youngster’s quickened awareness on the weapon’s capacity to take life away (sense of what rifle meant). Heaney begins to recite a familiar liturgy (as it was in the beginning) but halts in mid-sentence unable to continue with its promise of eternal life (‘is now and ever shall be’); the idea that has germinated in his mind over time has concluded ‘no next-time-round’ (Lightenings i)- after death, the soul like a white cloth snatched away is catapulted into infinite, lifeless space (Across dark galaxies). The air-rifle experience led him to question the Catholic tuition he received as a boy, likening his shot to a damaging act (sin) that left in doubt a massive chunk of faith (eternal life) and cemented the alternative metaphysic that was gathering strength in his mind: Another phrase dilating in new light. Heaney will reprise his feelings in ‘The door was open and the house was dark’ from his final collection Human Chain of 2010: standing outside the home of David Hammond, the poet senses a powerful surge that he takes to be the man’s soul/ spirit leaving his home: ‘a withdrawal, a not unwelcome/ emptiness’. Witnessing the political and sectarian turmoil of his native Ulster Heaney came to know only too well the destructive potential of weaponry in the wrong hands. District and Circle, fifteen years later, will recount in Senior Infants the apprehension he felt at the home of a primary school aged Protestant ‘friend’ for whom use of an air-rifle was common practice.